Mr. Murphy is a 68-year-old uncontrolled diabetic who enjoys walking around his house in socks. Due to his diabetic neuropathy, he doesn’t realize that the blister from his poorly fitting shoes has now developed into an infected diabetic foot ulcer. Only after his daughter notices his red, swollen foot and leg does he seek medical attention. The diagnosis of cellulitis with osteomyelitis of the 1st and 2nd metatarsal heads is quickly followed by a medial ray amputation and 6 weeks of IV antibiotic therapy. Does this scenario sound familiar? Would you have been able to change the outcome if Mr. Murphy had been treated after getting a simple blister? Before he bought the wrong footwear? Before the ulcer probed to bone? Taking care of the diabetic patient is particularly challenging because of the risk of diabetic foot ulceration. After watching this recording, you will have the confidence to properly perform a foot exam, prevent diabetic foot complications and treat acute or chronic foot wounds. Dr. Farrer’s style of presentation is energetic, interactive and includes case studies that help make learning more personal. Gain the knowledge of properly off-loading the diabetic foot ulcer, choosing the proper wound treatment protocol and even when to use advanced therapies. Dr. Farrer will demonstrate ways to safely reduce those thick fungal toenails and share her serial debridement skills with a scalpel or tissue nippers. She will also share her best strategies to get patients involved in their own care… and you will see adherence rates increase for better outcomes. This is one practice-changing educational recording you don’t want to miss! 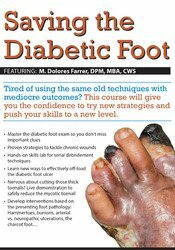 Perform a complete diabetic foot exam including vascular and neurological assessment. Determine how the progression of diabetes affects the lower extremity specifically. Decide between new off-loading strategies to facilitate healing the chronic wound while allowing your patient to stay active. Choose patient teaching strategies that will encourage adherence to the treatment plans by making the patient an active part of the wound care team. Substantiate various advanced wound care treatments to achieve the best results. Choose the proper shoes and inserts by understanding the biomechanical stresses and foot deformities that are unique to the diabetic foot. Manage the debridement procedures for a variety of foot concerns, including: corns, callouses and wounds. Why do diabetics get neuropathy? Want to successfully reduce a corn or callous - but afraid to cut the patient? Tentative about debriding that ulcer and not knowing how far to cut? Tired of repeating the same instructions only to have your patient continue to ignore your “suggestions”? We are inundated with so many wound products and advanced dressings - how to decide? Does higher cost truly drive better outcomes? M. Dolores Farrer is a surgically trained podiatrist involved in lower extremity wound care for over 23 years. She is board certified by the American Board of Wound Management for over 13 years. For the past 8 years, Dr. Farrer has worked at the DORN VA Hospital in Columbia, South Carolina providing our nation's heroes with a comprehensive multi-specialty wound care program that has resulted in above average healing rates and decreased amputation rates. She is also Primary Investigator involved in several research projects on new technologies in wound care products. Dr. Farrer has experience in private practice, hospital out-patient wound clinics, and nursing homes. She has spoken nationally and enjoys sharing her knowledge and experience as a wound care expert in an interactive and energetic fashion that will keep you engaged. She is a graduate of the Ohio College of Podiatric Medicine and obtained her MBA in her home town of New Orleans, Louisiana. Financial: M. Dolores Farrer has an employment relationship with DORN VA Hospital. She receives a speaking honorarium from PESI, Inc.
Nonfinancial: M. Dolores Farrer has no relevant nonfinancial relationships to disclose. Nurses completing these self-study materials will earn 6.3 contact hours. Expires: 3/23/2021.